Undeniably almost every Vietnam movie or story ever made seems to continuously subscribe to a nihilist rite of passage for American soldiers who go from boys to men in one tour of duty. Hopefully Hollywood can uncover this gold mine of originality that is very accessible to new and old readers of comic books. Brahm Revel’s Guerillas began conventionally as a cliche’ band of brothers but quickly made an unconventional plot twist that invoked cinema based themes in Platoon and the Island of Doctor Moreau. Disillusioned John Francis Clayton, the book’s main protagonist, was drafted into a war that he quickly wanted no part in. War may not be fit for man but beast as Clayton was saved by trained guerillas gone rogue. Clayton discovered his new found Ape platoon to be more humane than the one he lost in a fire fight. It seemed clear that animals are far more proficient killers and Mr. Revel didn’t hesitate in how men and ape aren’t inherently evil but both are trained as killers. As the story progressed their advantageous ability to nurture shined through the chaos and killing. Perhaps Mr. Revel was trying to say we could learn a lot about the way animals behave and maybe their code of acceptance isn’t defined by race or species but naivety. As a story board artist for the Venture Brothers, Mr. Revel’s visual language never failed to be clear and effective in pushing the story forward even when dialogue was absent. Much like the Venture Brothers he balanced the darker violent components with equally lighter moments such as using a soldier man’s love for cigarettes to cleverly articulate monkey see, monkey do humor. 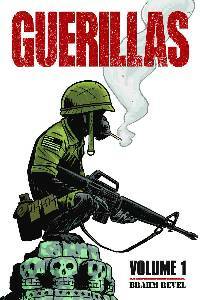 Guerillas is a book about survival, coming of age, and most importantly acceptance. We all want to be on the same side but for whatever reason, we can’t accept each other for who we are. If animals can live with man, why can’t we accept each other? Perhaps human beings suffer from a rare gene that animals have. It’s called common sense. If I had to rate Guerillas, I’d give it a refreshing after work beer that is familiar and yet something to look forward to. Cheers. More than just an exercise in T-shirt culture, Scott Pilgrim might be in over his head if he can’t find a way to defeat all of Ramona’s evil Ex-lovers. Whether or not you are a gamer, every one can relate to love as a game. 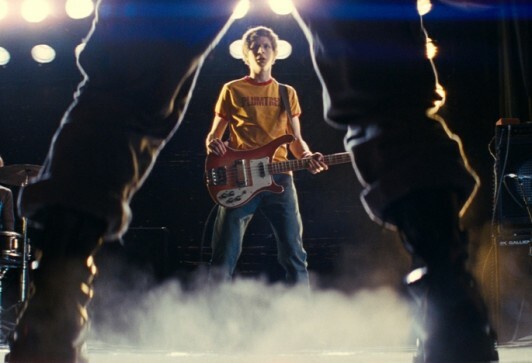 Scott Pilgrim vs the world was the 7th level of a no holds barred fight to the finish for the girl you love. 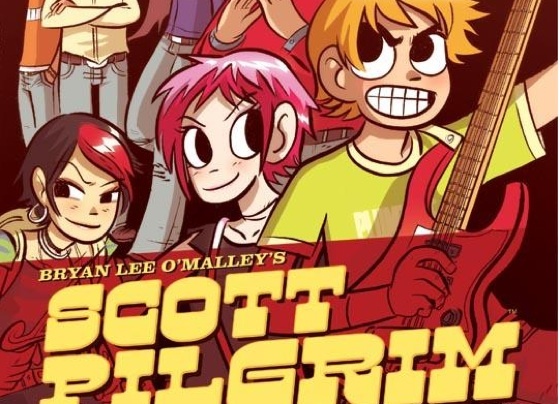 Director Edgar Wright took the best elements of Bryan Lee O’Malley’s 6 book series by emphasizing the video game spoofs and clever visual language. For all intents and purposes, the adaptation worked on the cinematic stage. In a similar set up to Shaun of the Dead, the main protagonist was a slacker, content to simply exist in his small fish bowl world until a crisis threatened to take away the one thing he desperately loved more than garlic bread. Not much of a stretch for Michael Cera to play a self absorbed amoral puppy who often took the path of least resistance when it came to his prior relationships. 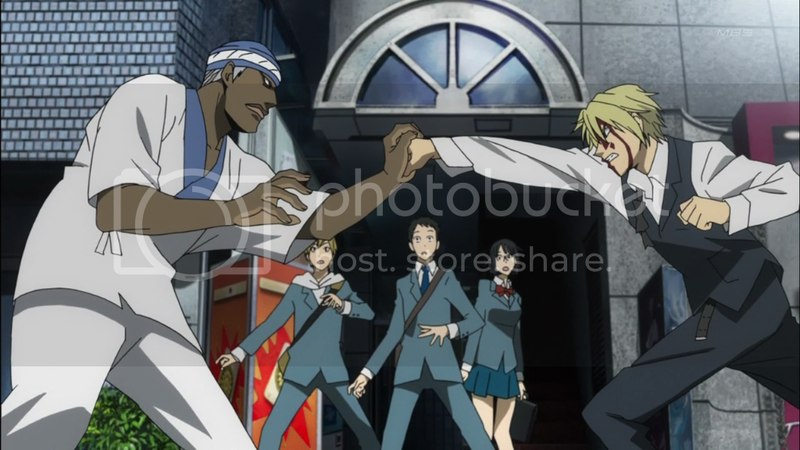 Cera’s comedic limitations were identified in the scene where his character was so desperate to get dumped, he resorted to racial insults. Without the right comedic timing, the delivery felt awkward. Pilgrim’s love interest played by Mary Elizabeth Winstead captured Ramona Flowers’ reserved, mysterious beauty with poker faced emotionally withdrawn expressions. Is she concealing her emotions for Scott or is she emotionally immune to his charms? The ambiguous nature of her character was necessary to convince us that a reckless young man’s pursuit to capture what was deemed unattainable seemed logical and convincing between two young people. 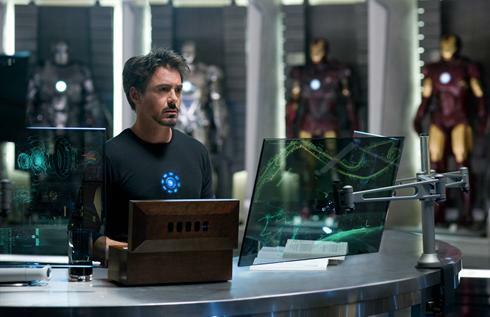 The more enjoyable super hero movies are attributed to great acting performances by the villains. Have no fear, the performances delivered by each evil ex exhibited their best characteristics and most fun in the film. Balancing the theatrical dialogue with the physical demands, each fight scene was brilliantly choreographed and executed. Even if the viewers didn’t catch all the homages to specific old school video games, they certainly enjoyed the vibrant colors, stunts, and camerawork. In my never ending homage to George Thorogood’s One bourbon, one scotch, one beer I am giving Scott Pilgrim vs. the World a rating of a great tasting bourbon that provided good times, action, adventure, and a righteous score for the good guys. AMC is the latest to venture into the popularity of comic book adaptations with the Walking Dead. This post apocalyptic world created by writer Robert Kirkman chronicled a Georgia policeman awoken from a coma, only to face a world populated by moving corpses hungry for living flesh. The title itself was a reference to the uncertain future of the remaining survivors who may lose their sanity before their number is up. One wonders about the TV ratings for such a bleak existence. It’s a safe bet that the first couple seasons will be atop the ratings chart. However, the zombie craze hasn’t been known to have a long life span. How will television succeed where cinema has failed in sustaining a serious zombie horror story? Garfield may not look like Rick Grimes but if he can channel him, the Walking Dead will do justice to its fans. Zombies pose a unique challenge. They don’t exhibit much personality. Watching only lifeless corpses roam around aimlessly would test even the most enthusiastic nature channel lover. Therefore, the story doesn’t sell without compelling characters. 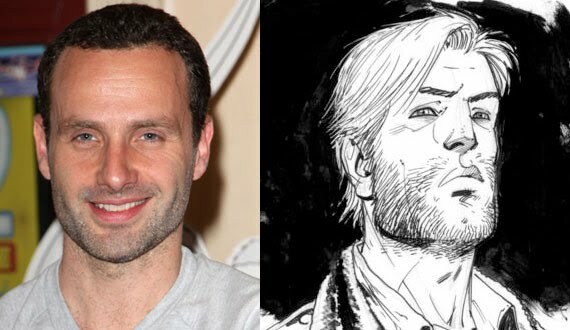 All eyes will be on Love Actually’s Andrew Lincoln to deliver the goods as Rick Grimes. Lincoln is the only actor cast that has very little resemblance to his comic book character. One can only assume his tryout was so impressive that comic book creator Robert Kirkman and director Frank Darabont were willing to disregard the aesthetic differences. Hopefully, Lincoln learned not to use the same cliche’ Southern twang that most U.K. actors use like a crutch in their dialogue. Modern American audiences are well traveled enough to realize these characters are in the South without reminding them in every single sentence of dialogue. Otherwise such a grievous error ceases to become pertinent to the character and more of a characteristic to a dated stereotype. Survival of the Dead’s box office returns were more frightening than the actual movie. Not even Romero’s die hard fans came out to embrace this chapter of his never ending zombie saga. Zombies are not an easy subject to keep the audience’s interest. Just ask the legendary George Romero. Twenty years after Day of the Dead (1985), Romero tried a comeback with diminishing returns. Different directors have tried to switch the formula up with some success. Zombie satires seem to be en vogue. However, no one has touched the idea of a TV series till now. 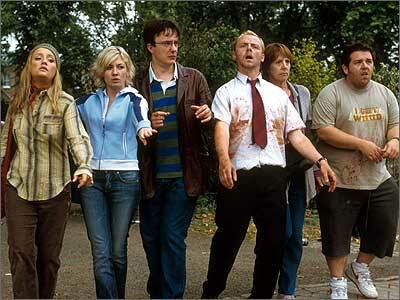 With Shaun of the Dead, Scott Pilgrim’s director Edgar Wright had greater success breaking the box office ice with a hysterical satire on the zombies. Ruben Fleischer followed with Zombieland. Will zombies ever be taken seriously again? Frank Darabont was challenged with adapting this monthly title into a weekly TV series. Darabont has the resume to make even the most hardened zombie cynic hopeful. He directed several adaptations of Stephen King’s works such as the Woman in the Room, the Shawshank Redemption, the Green Mile, and the Mist. If there’s one thing Darabont can capture, it’s desperation. It will be a recurring theme on a show where the elevator of emotions only leads to the basement. If the TV series is loyal to its source material, there will be no stylized acts of zombie killing. It’s really a drama about human beings clinging to what shreds of humanity that they have left. Survival and morality will be the two muses tormenting them at every step. 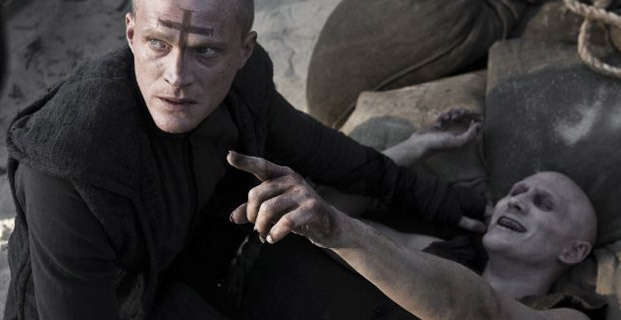 With both Kirkman and Darabont overseeing the project, I recommend the Walking Dead for your viewing pleasure in a dark world. The Walking Dead debuts on AMC in the Fall.